So I am a few months removed from these original photos, but it seemed like a good time to post them as we are in the midst of a fall rainfall. This past summer, I made my annual trek out to the farmlands to pick strawberries. I went to a farm I have been going to for the last few years. It’s a lot quieter and closer than the other one and although it has less bells and whistles, I don’t really need to do much other than pick fruit! I went to Emma Lea Farms on Westham Island, about a 25 minute drive for me. Westham Island is so beautiful and feels very untouched. There’s a short wooden bridge to the island and it only fits one car at a time, so that tells you how quiet the Island is. Along with Emma Lea Farms, there’s a winery, herb farm, and bird sanctuary. In late May, I get that familiar feeling – it’s almost strawberry season! I start looking at the Emma Lea website for picking dates and schedule accordingly. Usually in mid-June is when I make my trip and I start looking around my building’s recycling area for a box up for the challenge (go cardboard over plastic, doesn’t trap heat in). I selected a box and off I went! Unfortunately I didn’t pick a sturdy enough box (nor did I get a wagon to help me transport) and I had a very uncomfortable walk back to the pay station. Let’s just say that carrying 22lb of strawberries in a quickly wilting box makes you regret things…fast! Anyway, I somehow made it home and I was off to the processing races! Out of the 22lbs: I made jam, ice cream, and froze the rest. Mother Woo did get some and I set some aside for myself to eat. But for those who have picked strawberries before, they don’t last very long. I was proud that I managed to get all of them washed and processed by the end of the day. 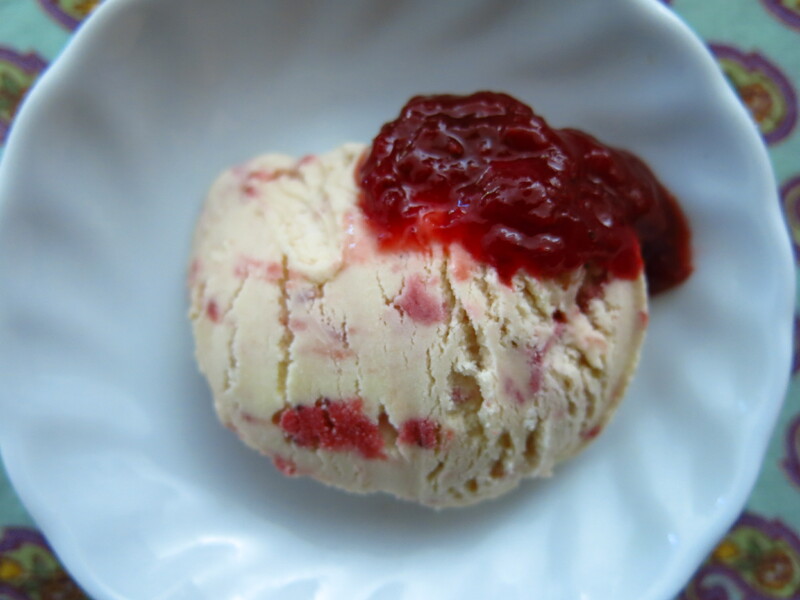 Included in the products was a roasted strawberry ice cream (David Lebovitz to the rescue!) which I amped up with a bit of white chocolate. Lebovitz recommends you roast the berries to remove some of the moisture as well as pump up the flavour. And it did!